The 11th Annual CASE Legislative Leadership Summit was a huge success with 86 participants from 26 states this past week. The Reception on Monday night was a huge success with Michael Yudin, Acting Assistant Secretary of the Office of Special Education and Rehabilitative Services delivering the special comments. The Hill breakfast with Dr. Michael Gamel-McCormick from the Senate Health, Education, Labor, and Pension committee was enlightening. Dr. Gamel-McCormick encouraged everyone to form relationships, be honest, and relay stories backed up with data with the Senators. If you were not a part of this great professional development event, make your plans to attend next year, July 13-16, 2014! PS ...Time is running out on the Early Bird Registration for the 24th Annual CASE Conference to be held September 26-28 in Indianapolis, IN. The Early Bird discount ends July 31. Go to www.casecec.org to register now! Sure, there have been proposals put forth during this time — notably in 2007, 2011 and now in 2013. But we still remain without a bill that both the House and Senate can agree upon. Last month, the House and Senate Education Committees move forward with their different visions for ESEA reauthorization. And now the full House of Representatives will begin debate over the Student Success Act (HR 5), the House's version of ESEA which passed the education committee on a strict party line vote (all Republicans for, all Democrats against). President Barack Obama announced his intention to nominate Michael Yudin to become the assistant secretary for the Office of Special Education and Rehabilitative Services (OSERS), within the U.S. Department of Education. Yudin has been acting assistant secretary for OSERS since August 2012. CEC applauds the president's nomination of Yudin, who has been an active advocate for children and youth for disabilities throughout his career. A growing number of states are meeting their responsibilities to provide special education services, federal officials say. In letters sent to each state this month, the U.S. Department of Education indicated that 38 states met their obligations to serve students with disabilities for the 2011-2012 school year. The New York Times recently reported that attention-deficit/hyperactivity disorder is being diagnosed in "nearly 1 in 5 high school-age boys in the United States and 11 percent of school-age children." Students with disabilities will be able to use read-aloud accommodations on the English/language arts portion of the common core tests, with no requirement that they be virtually unable to read printed text or be at the beginning stages of learning to decode. A growing number of states are meeting their responsibilities to provide special education services, federal officials say. In letters sent to each state this month, the U.S. Department of Education indicated that 38 states met their obligations to serve students with disabilities for the 2011-2012 school year. That's up from 29 the year prior. Each year, the Education Department assesses how well states fulfill their plans under the Individuals with Disabilities Education Act and assigns one of four ratings: "meets requirements," "needs assistance," "needs intervention" or "needs substantial intervention." A gift for spatial reasoning — the kind that may inspire an imaginative child to dismantle a clock or the family refrigerator — may be a greater predictor of future creativity or innovation than math or verbal skills, particularly in math, science and related fields, according to a study published in the journal Psychological Science. The study looked at the professional success of people who, as 13-year-olds, had taken both the SAT, because they had been flagged as particularly gifted, as well as the Differential Aptitude Test. Having a clear vision when contemplating a school or district mobile learning program, as well as being flexible when building that program, are two essential steps if school technology leaders want to bring a mobile learning initiative to fruition. During an edWeb.com webinar on mobile learning, Scott Newcomb, a teacher at St. Marys Intermediate School in Ohio and themobilenative.org blogger, shared experiences and tips he has gained in the five years that his school has operated a "bring your own device" mobile learning initiative. It's the first test to diagnose the behavioral disorder using brain wave patterns, but it won't be the last. The idea of reading the brain's activity for clues to mental illness is gaining ground. As Roxanne Khamsi reported in TIME recently, researchers are learning enough about the signature patterns of normal, and abnormal brain activity that they believe it may be possible to diagnose mental illnesses ranging from depression, schizophrenia, autism and attention deficit-hyperactivity disorder by studying readouts of brain waves, much in the way they now rely on elecrocardiograms to diagnose heart problems. President Barack Obama is threatening to veto a House bill to update the No Child Left Behind education law. The bill, called the Student Success Act, would "represent a significant step backwards in the effort to help our Nation's children and their families prepare for their futures," the White House said in a statement on Wednesday. The administration worries that the bill, authored by Reps. John Kline, R-Minn., and Todd Rokita, R-Ind., is too lax on state education standards, neglects students in historically underserved areas and fails to address poorly performing schools. With the U.S. House of Representatives slated to debate major K-12 legislation as soon as today, a broad-based STEM coalition argues that the bill lacks a robust STEM education focus and should not be supported. A key complaint of the STEM Education Coalition — which includes leaders in education, business, and the STEM professions — is that the Republican bill to rewrite the federal No Child Left Behind Act would abolish the Mathematics and Science Partnerships program. Funded at $142 million for the current fiscal year, this program seeks to improve the content knowledge of teachers in math and science, and to help improve student achievement. Education Secretary Arne Duncan said he's urging reluctant Republicans in Congress to get on board with funding universal preschool. One of the big sticking points for Republicans has been coming up with new money for the program. "I'm spending time every day, including this morning, talking to Republican members of the House and Senate to try and encourage them to be supportive of this," he said. A panel tapped by the national accreditation body for teacher preparation has finalized a set of standards that, for the first time, establishes minimum admissions criteria and requires programs to use much-debated "value added" measures, where available. The action promises to have major ramifications for how programs select, prepare, and gauge the success of new teachers. 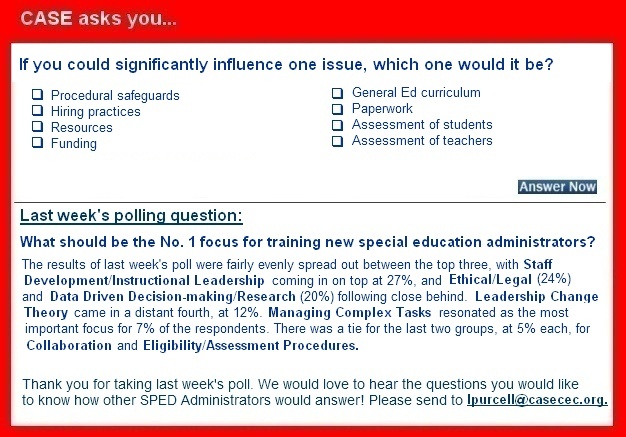 Already, programs planning to seek the seal of approval from the Council for Accreditation of Educator Preparation say the standards are significantly more demanding than those used by the National Council for Accreditation of Teacher Education, one of two accreditors that preceded CAEP. Scott Barry Kaufman knew he was different from his classmates. The evidence was overwhelming: he was about to enter the third grade for the second time, and he was subjected to beatings on the bathroom floor, doled out by bullies who regularly reminded him that he would never, ever be anything other than a failing third-grader. As Kaufman recounts in a book released this spring, his family finally had his intelligence tested, and that afternoon with the school psychologist would change the course of his life. What does it take to improve a school? What kinds of programs, systems and people need to be in place for educational outcomes to improve overall? These and other questions continue to vex policymakers who — along with researchers, reformers, and advocates — pore over data and case studies looking for tools to transform schools into places where all students achieve. Sadly, there is no silver bullet. But there are features and structures of schools that have shown improvement that can help educational leaders see a path forward.